Homeocan Real Relief Allergy Tablets 60 Tablets are one of the allergy formulas ChelseaMarket.ca offers. Take a look at other homeopathy products and allergy formulas. Homeocan has been a Canadian leader in the manufacturing and the distribution of natural health products. since 1987. Founded by Michele Boisvert and headquarted in Montreal, Homeocan serves over 10 000 customers in 16 countries. In the USA and outside Canada, Homeocan is represented by Homeolab USA. Since their inception, Homeocan Laboratories’ mission has been to provide Canadians with access to high quality homeopathic and natural products. 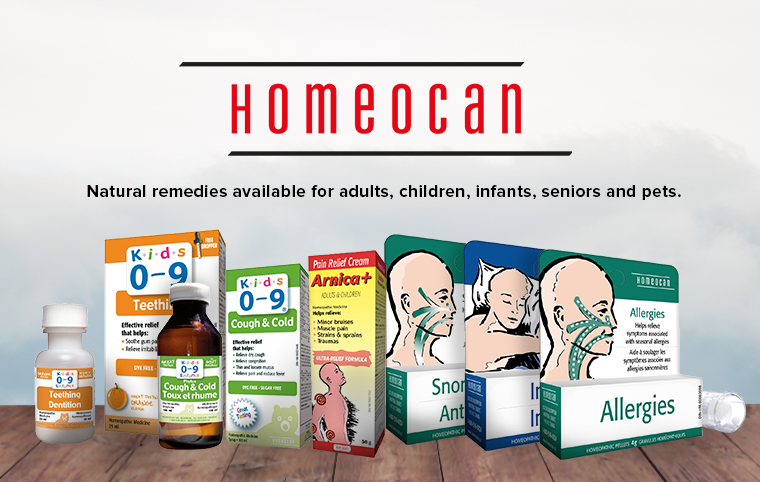 Present in pharmacies and natural health food stores, Homeocan Laboratories provide opportunities for families to heal naturally from a company in which they can trust. Her nomination at the CHFA Memorial Hall of Fame in 2013 recognizes her outstanding contribution to the development and growth of the industry. In March 2013, Homeocan completely renovated its laboratory in order to ensure a production with optimal quality. Isolated with airtight doors from the other areas and with a controlled pressure atmosphere, it guarantees complete security during the manufacturing process. New equipment was also added: 6 new laminar flows, 2 IMPREGMAT machines for the impregnation of pellets, granules, and tablets, and one Korsakov machine for the automatic preparation of Korsakovian dilutions. With the best materials on the market, Homeocan is sure to provide a wide range of premium quality natural products. For Homeocan, contributing to the wellbeing of its community is essential. For several years, the company has been investing locally through donations and sponsorship programs. Several fundraisings have been done for the Cystic Fibrosis Foundation. Homeocan has also supported the Jean-Lapointe Foundation against drug addiction and The Orchestre de Chambre I Musici de Montreal. For many years, Homeocan has been a proud sponsor of the Orchestre Symphonique de Montreal, with the Homeocan Grand Concerts Tuesdays.